Oxfordshire is the epitome of English rural life. Its landscape is green, its villages are charming, and its lawns are well manicured. The River Thames flows through the county, carrying with it a sense that life couldn't be more elegant. 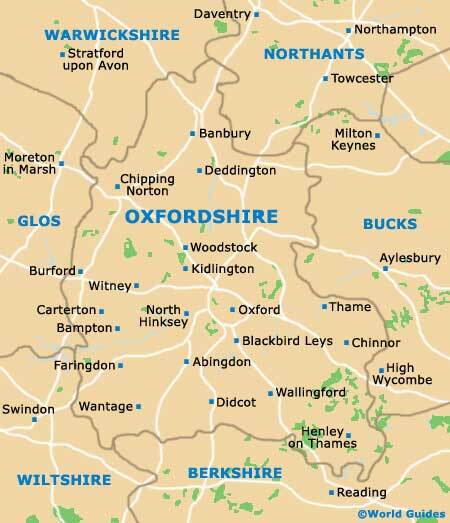 At the centre of Oxfordshire life are the 'dreaming spires' of Britain's most ancient of academic institutions, Oxford University, a name that is synonymous with academic excellence. There is no escaping the fact that Oxford and its famous university are the real tourist attractions here. During the summer months, in particular, the city's streets teem with visitors keen to breathe in the atmosphere of privilege and learning. It is, after all, Britain's oldest university, and its rich heritage extends to cover large tracts of the city. Some 39 individual colleges cater for the university's student population. Within their closely guarded hallowed walls are tiny courtyards of tranquility. The fictional detective Inspector Morse, created by Colin Dextor, solved many a mystery set against the city's backdrop of privilege and learning. Oxford is also home to some quite esteemed museums and libraries, including the Bodleian, one of the oldest of its kind in Europe. Referred to simply as 'The Bod' by those in the know, it is where you are most likely to find Oxford's most earnest scholars hard at work. The spired monument dedicated to the Oxford Martyrs tells of more turbulent times in the city. Three Anglican bishops were burnt at the stake at the place currently occupied by Broad Street. Outside of the city's limits is Blenheim Palace, home of Sir Winston Churchill and the work of the architect John Vanbrugh. There is a much more down to earth part of Oxfordshire life, the point where town meets gown. Cowley in Oxford was the home of the Morris motor factory, where cars were mass-produced from the 1920s. Today, the car factory operates under changed ownership and is known as Plant Oxford.